I’m teaching a workshop on Japanese text mining this week and am getting all kinds of interesting practical questions that I don’t know the answer to. Today, I was asked if it’s possible to batch convert .docx files to .txt in Windows. You can convert to a bunch of different formats, including txt, html, rtf, rtfd, doc, docx, wordml, odt, or webarchive. It puts the files in the same directory as the source files. That’s it: enjoy! * Note: This worked fine with UTF-8 files using Japanese, so I assume it just works with UTF-8 in general. YMMV. I heard a remark the other day that struck a cord – or, churned my butter, a bit. Now, at Penn, we have digitized a couple of Japanese collections: Japanese Juvenile Fiction Collection (aka Tatsukawa Bunko series), Japanese Naval Collection (in-process, focused on Renshū Kantai training fleet materials), and a miscellaneous collection of Japanese rare books in general. * These materials have been used both in person (thanks to publicizing them, pre- and post-digitization, on library news sites, blogs, and social media as well as word-of-mouth), and also digitally by researchers who cannot travel to Penn. In fact, a graduate student in Australia used our juvenile fiction collection for part of his dissertation; another student in Wisconsin plans to use facsimiles of our naval materials once they’re complete; and faculty at University of Montana have used our digital facsimile of Meiji-period journal Hōbunkai-sui (or Hōbunkai-shi). These researchers, due to distance and budget, will likely never be able to visit Penn in person to use the collections. On top of that, some items – like the juvenile fiction and lengthy government documents related to the Imperial Navy – don’t lend themselves to using in a reading room. These aren’t artifacts to look over one page at a time, but research materials that will be read extensively (rather than “intensively,” a distinction we book history folks make). Thus, this is the only use they can make of our materials. The digitization of Japanese collections at Penn has invited use and a kind of library visit by virtue of being available for researchers worldwide, not just those who are at Penn (who could easily view them in person and don’t “need” a digital facsimile), or who can visit the library to “smell” the books (as the person I paraphrased put it). I think it’s more important to be able to read, research, and use these documents than to smell or witness the material artifact. Of course, there are cases in which one would want to do that, but by and large, our researchers care more about the content and visual aspects of the materials – things that can be captured and conveyed in digital images – rather than touching or handling them. Isn’t this use, just as visiting the library in person use? Shouldn’t we be tracking visits to our digital collections, downloads, and qualitative stories about their use in research, just as we do a gate count and track circulation? I think so. As we think about the present and future of libraries, and people make comments about their not being needed because libraries are on our smartphones (like libraries of fake news, right? ), we must make the argument for providing content both physically and virtually. Who do people think is providing the content for their digital libraries? Physical libraries, of course! Those collections exist in the real world and come from somewhere, with significant investments of money, time, and labor involved – and moreover, it is the skilled and knowledgable labor of professionals that is required. On top of all of this, I feel it is most important to own up to what we can and cannot “control” online: our collections, by virtue of being able to be released at all, are largely in the public domain. Let’s not put CC licenses on them except for CC-0 (which is explicitly marking materials as public domain), pretending we can control the images when we have no legal right to (but users largely don’t know that). Let’s allow for free remixing and use without citing the digital library/archive it came from, without getting upset about posts on Tumblr. When you release public domain materials on the web (or through other services online), you are giving up your exclusive right to control the circumstances under which people use it – and as a cultural heritage institution, it is your role to perform this service for the world. But not only should we provide this service, we should take credit for it: take credit for use, visits, and for people getting to do whatever they want with our collections. That is really meaningful and impactful use. * Many thanks to Michael Williams for his great blog posts about our collections! As I begin working on my project involving Taiyō magazine, I thought I’d document what I’m doing so others can see the process of cleaning the data I’ve gotten, and then experimenting with it. This is the first part in that series: first steps with data, cleaning it, and getting it ready for analysis. If I have the Taiyō data in “plain text,” what’s there to clean? Oh, you have no idea. What am I working on these days? Well, one thing is working with the Taiyō magazine corpus (1895-1925, selected articles) from NINJAL, released on CD about 10 years ago but currently being prepared for web release. In addition, I should note that Taiyō has been reproduced digitally as a paid resource through JKBooks (on the JapanKnowledge+ platform). Taiyō was a general-interest magazine spanning Meiji through Taishō periods in Japan, with articles on all topics as well as fiction, and innovative for its time in 1895 with the use of lithography to reproduce pages of photographs. (And let me tell you, they were random at the time: battleships, various nations’ viceroys, stuff like that. I’m not making this up.) Unfortunately, the text-only nature of my project doesn’t reflect the cool printing technology and visual nature of the magazine, but I was wondering, what can I do with just the text of the articles and metadata kindly provided by NINJAL (including genre by NDL classification and style of writing). Especially because of the discourse in the early 20th century of naichi 内地 (inner lands or “home islands”, referring to the archipelago of Japan we know today) and gaichi 外地 (outer lands or “colonies”, referring to Korea/Taiwan), which are both subsumed under the name of Japan, I’m really interested in how those terms were being used, other terms that might have been used as well, and what qualities and relationships were associated with them. How did Japanese define these areas and how did it change over time? While I can’t get in the minds of people in the imperial period, I can take a look at one of its most popular magazines, intended for a broad audience, to see at least the public, print discourse of the nation and empire. How to work with it, though? That’s where I’m still just beginning. It’s a daunting project in some ways. For example, I am not a linguist, let alone a Japanese linguist. I haven’t specialized in this period in the past, so keywords for territories will take some research on my part (for example, there were multiple names for Taiwan at the time in addition to the gaichi reference). Moreover, the corpus is 1.2 GB in UTF-8 text (which I converted from sentence-tokenized XML to word-tokenized, non-tagged text). It breaks Voyant Server and Topic Modeling Tool on my machine with 12 GB RAM when attempting to analyze the whole thing at once. Of course, I could split it up, but then that raises another methodological question: how and why to split it up? What divisions should I use: years, genres, authors, etc.? Right now I have it in text files by article, but could combine those articles in any number of ways. I am also stymied by methodologies for analysis, but my plan at the moment is to start by doing some basic visualizations of the articles, in different groupings, as an exploration of what kind of things people talked about in Taiyō over time. Are they even talking about the nation? When they talk about naichi what kinds of things do they associate with those territories, as opposed to gaichi? Is the distinction changing, and is it even a reliable distinction? As a Price Lab Fellow this year at Penn, I hope to explore these questions and start to nail down what I want to analyze in more detail over time in Taiyō — and hopefully gain some insight into the language of empire in Japan 1895-1925. In addition I’ll be presenting about this at a workshop at the University of Chicago in November, so if you’re in the area please attend and help me figure all this out! I just got off the phone with a researcher this morning who is interested in looking at sentiment analysis on a corpus of fiction, specifically by having some native speakers of Japanese (I think) tag adjectives as positive or negative, then look at the overall shape of the corpus with those tags in mind. How is my definition of sentiment analysis different? How about I start with the methodology? What I did was look for salient adjectives, which I searched for by looking at most “salient” nouns (not necessarily the most frequent, but I need to refine my heuristics) and then the adjectives that appeared next to them. I also used Wordnet to look for words related to these adjectives and nouns to expand my search beyond just those specific words to ones with similar meaning that I might have missed (in particular, I looked at hypernyms (broader terms) and synonyms of nouns, and synonyms of adjectives). My method of sentiment analysis ends up looking more like automatic summarization than a positive-negative sentiment analysis we more frequently encounter, even in humanistic work such as Matt Jockers’s recent research. I argue, of course, that my method is somewhat more meaningful. I consider all adjectives to be sentiment words, because they carry subjective judgment (even something that’s kind of green might be described by someone else as also kind of blue). And I’m more interested in the character of subjective judgment than whether it should be able to be considered ‘objectively’ as positive or negative (something I don’t think is really possible in humanistic inquiry, and even in business applications). In other words, if we have to pick out the most representative feelings of people about what they’re experiencing, what are they feeling about that experience? After all, can you really say that weather is good or bad, that there being a lot of farm fields is good or bad? I looked at 19th-century British women’s travel narratives of “exotic” places, and I found that their sentiment was often just observations about trains and the landscape and the people. They didn’t talk about whether they were feeling positively or negatively about those things; rather, they gave us their subjective judgment of what those things were like. My take on sentiment analysis, then, is clearly that we need to introduce human judgment to the end of the process, perhaps gathering these representative phrases and adjectives (I lean toward phrases or even whole sentences) and then deciding what we can about them. I don’t even think a human interlocutor could put down a verdict of positive or negative on these observations and judgments – sentiments – that the women had about their experiences and environments. If not even a human could do it, and humans write and train the algorithms, how can the computer do it? Is there even a point? Does it matter if it’s possible or not? We should be looking for something else entirely. * I’m also trying to write a more extensive and revised paper on this, meant for the new incarnation of LLC. Several years ago, I attended Digital Humanities 2011 at Stanford and had the opportunity to meet with Franco Moretti. When Franco asked what I was interested in, I admitted that I badly wanted to see the Literary Lab I’d heard so much about, and seen so much interesting research come out of. He laughed and said he’d show it to me, but that I shouldn’t get too excited. Why? Because Literary Lab is a windowless conference room in the middle of the English department at Stanford. Literary Lab is a room with a whiteboard. I couldn’t have been more excited, to Franco’s amusement. A room with a whiteboard. A room dedicated to talking about projects, to collaborating, to bringing a laptop and getting research done, and to sharing and brainstorming via drawing and notes up on a wall, not on a piece of paper or a shared document. It was an important moment for me. When I was in graduate school, I’d tossed around a number of projects with colleagues, and gotten excited about a lot of them. But they always petered out, lost momentum, and disappeared. This is surely due to busy schedules and competing projects – not least the dissertation – but I think it’s also partly due to logistics. Much as our work has gone online, and despite these being digital projects – just like Literary Lab’s research – a physical space is still hugely important. A space to talk, a space to brainstorm and draw and write, a space to work together: a space to keep things going. I had been turning this over in my head ever since I met with Franco, but never had the opportunity to put my idea into action. Then I came to Penn, and met a like-minded colleague who got just as excited about the idea of dedicated space and collective work on projects as I was. Our boss thought the idea of a room with a whiteboard was funny, just as Franco had thought my low standards were kind of silly. But you know what? You don’t need a budget to create ideas and momentum. You don’t need a budget to stimulate discussion and cross-disciplinary cooperation. You just need space and time, and willing participants who can make use of it. We made a proposal, got the go-ahead, and took advantage of a new room in our Kislak Center at Penn that was free for an hour and a half a week. It was enough: the Vitale II lab is a room with a whiteboard. It even has giant TVs to hook up a laptop. Thus, WORD LAB was born: a text-analysis interest group that just needed space to meet, and people to populate it. We recruited hard, mailing every department and discipline list we could think of, and got a mind-boggling 15+ people at the first meeting, plus the organizers and some interested library staff, from across the university. The room was full. That was the beginning of September 2014. WORD LAB is still going strong, with more formal presentations every other week, interspersed with journal club/coding tutorials/etc. in OPEN LAB on the other weeks. We get a regular attendance of at least 7-10 people a week, and the faces keep changing. It’s a group of Asianists, an Islamic law scholar, Annenberg School of Communication researchers, political scientists, psychologists, and librarians, some belonging to more than one group. We’ve had presentations from Penn staff, other regional university researchers, and upcoming Skype presentations from Chicago and Northeastern. A room with a whiteboard has turned into a budding cross-disciplinary, cross-professional text analysis interest community at Penn. It’s come to my attention that Fukuzawa Yukichi’s (and others’) early Meiji (1868-1912) journal, Meiroku zasshi 明六雑誌, is available online not just as PDF (which I knew about) but also as a fully tagged XML corpus from NINJAL (and oh my god, it has lemmas). All right! I recently met up with Mark Ravina at Association for Asian Studies, who brought this to my attention, and we are doing a lot of brainstorming about what we can do with this as a proof-of-concept project, and then move on to other early Meiji documents. We have big ideas like training OCR to recognize the difference between the katakana and kanji 二, for example; Meiji documents generally break OCR for various reasons like this, because they’re so different from contemporary Japanese. It’s like asking Acrobat to handle a medieval manuscript, in some ways. In order to do this, we need whitespace-delimited text with words separated by spaces. I’ve written about this elsewhere, but to sum up, Japanese is not separated by spaces, so tools intended for Western languages think it’s all one big word. There are currently no easy ways I can find to do this splitting; I’m currently working on an application that both strips ruby from Aozora bunko texts AND splits words with a space, but it’s coming slowly. How to get this with Meiroku zasshi in a quick and dirty way that lets us just play with the data? So today after work, I’m going to use Python’s eTree library for XML to take the contents of the word tags from the corpus and just spit them into a text file delimited by spaces. Quick and dirty! I’ve been meaning to do this for weeks, but since it’s a “day of DH,” I thought I’d use the opportunity to motivate myself. Then, we can play. Exciting stuff, this corpus. Unfortunately most of NINJAL’s other amazing corpora are available only on CD-ROMs that work on old versions of Windows. Sigh. But I’ll work with what I’ve got. 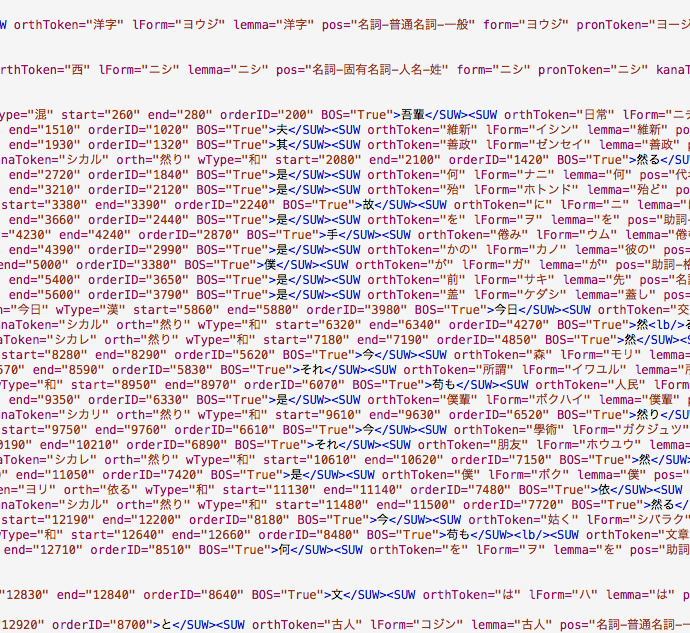 So that’s your update from the world of Japanese text analysis.